Published on January 26, 2018 in Lake Winnipesaukee Hotel. 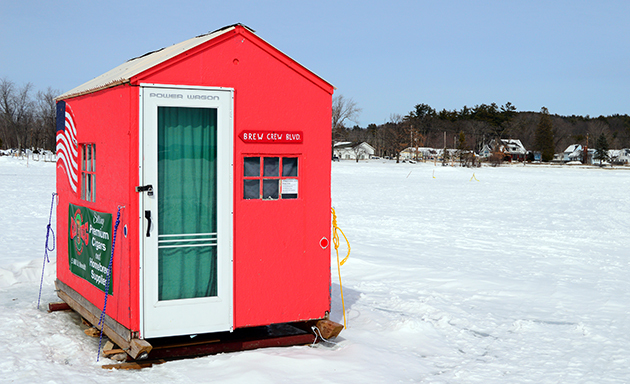 Closed Tags: ice fishing, ice fishing derby, lake winnipesaukee. With Lake Winnipesaukee frozen over, ice fishing enthusiasts from all over are flocking to New Hampshire’s Big Lake for a chance to catch their share of lake trout. When all the boats are stored for the season, there is still plenty of opportunity to throw a line in and enjoy a refreshing beer or beverage. Ice fishing offers the perfect activity to enjoy all of the beautiful scenery in the heart of winter on Lake Winnipesaukee. You certainly don’t need to wait until summer to get your fish on. Aside from the peace and relaxation that comes with ice fishing, the sport includes plenty of opportunities for social interaction. So, bring out the friends and family, spark up a charcoal grill and enjoy cooking lunch on the lake with a hot cocoa or cold beer in hand. Another added benefit of this winter sport is how much cheaper it is to ice fish. With the surface frozen over, you don’t need a boat to get out into the middle of the lake. With no boat, comes no cost for fuel or repairs, just take your equipment and head on out. If ice fishing is your thing and you’re interested in earning more than just a fish then you’re in luck, because it’s Fishing Derby time in the Lakes Region! 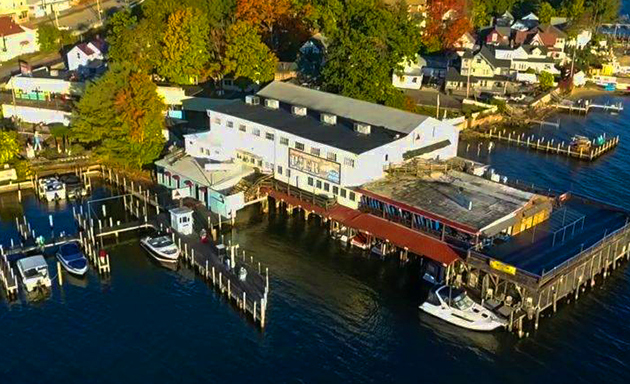 So, join us at the Center Harbor Inn located right on the shores of Lake Winnipesaukee, just down the road from the derby site in Meredith, NH. The Derby is taking place on February 10 – 11, 2018. With over $50,000 in prizes this is an event you won’t want to miss. The Center Harbor Inn is offering a fantastic promotion on rooms during the event which includes 15% off accommodations of two or more nights. For more information on the package check it out here. Besides being directly on the Lake, the Center Harbor Inn offers a delicious and locally sourced continental breakfast, a four-season outdoor hot tub with heated walkways to unwind in after a day on the ice, a relaxing sauna and a fitness center. Don’t miss out on this year’s Fishing Derby and stay in style at the Center Harbor Inn! Published on January 5, 2018 in Lake Winnipesaukee Hotel. Closed Tags: NEPHC, pond hockey, Pond Hockey Classic. 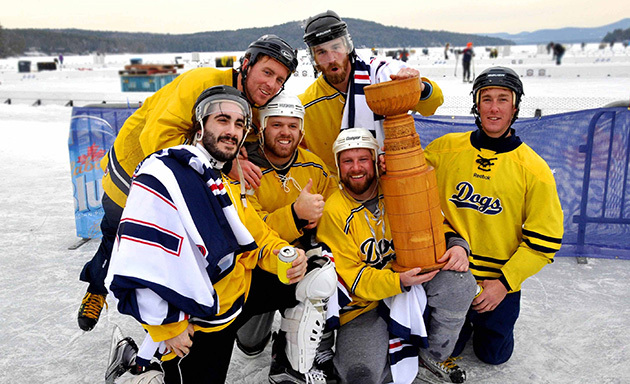 As winter fast approaches and the water freezes over, pond hockey players from all over New England will gather for the return of the 9th Annual New England Pond Hockey Classic taking place February 2 – 4, 2018. 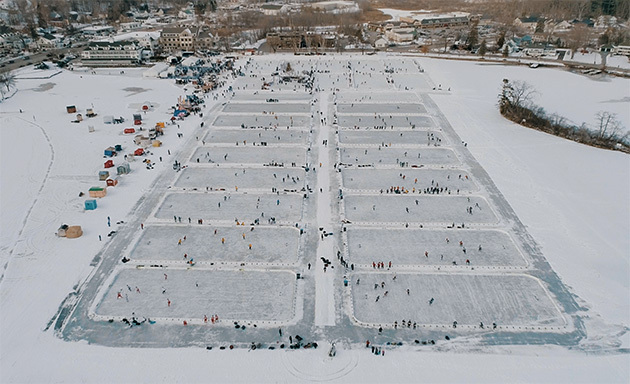 Taking over the nearby town of Meredith, the tournament brings tourists from all over the country to experience winter in the Lakes Region. Although the area is known as a summer lakeside destination, we are proud to be able to show off a side that not many people get to experience. The Center Harbor Inn is a great option for New England Pond Hockey Classic lodging. Just five minutes down the road from the tournament site in Meredith, NH we offer a great Pond Hockey Package as well as group rates so the whole team can stay together. The Pond Hockey Package includes 10% off your choice of accommodations for two or more nights. Amenities at the Inn include continental breakfast to fuel up before a busy day of skating on the ice. Breakfast selections offer locally roasted coffee and locally sourced bagels, as well as fruit cups, hard boiled eggs, homemade granola, yogurt, cereal, and energy balls. Aside from the great continental breakfast, a favorite amongst guests is the four-season outdoor hot tub with heated walkways and views that overlook beautiful Lake Winnipesaukee. After a long day on the ice, the hot tub is a great way to warm up and continue to enjoy winter by the lake while relaxing those sore muscles. Heading to the area and aren’t familiar with the town of Meredith? Check out our previous blog on Things to Do in Meredith NH for a list of restaurants, activities, and shopping options. Published on December 14, 2017 in Lake Winnipesaukee Hotel. Closed Tags: Lake Winnipesaukee Hotel, meredith nh. 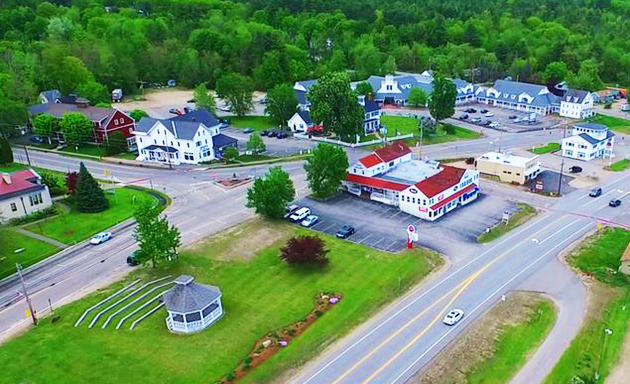 The bustling town of Meredith is Located just 5 minutes down the road from the Center Harbor Inn. During the summer months the area is a popular destination for tourists, making The Center Harbor Inn an ideal location as it has the benefits of being within close proximity to the area without actually being there. So, what are some things to do in Meredith? With an abundance of shopping, restaurants, and attractions it can get overwhelming. 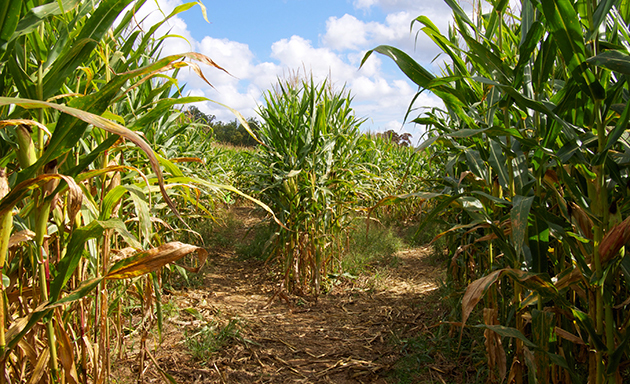 Take a look at the list below for some of our favorite things to do in Meredith. The Common Man is a family of restaurants that offer different themes and have options for every price range. Luckily, the town of Meredith offers four different Common Man restaurants that include: Lakehouse, Camp, Lago, and Town Docks. For a romantic date night out, we recommend Lago, known for its rustic Italian specialties they offer some of the best seafood and steaks around. Camp, brings back all of those memories of going away to a camp on the Lake, they serve up great comfort food and offer desserts including S’mores to bring you right back to your childhood. For dinner and a view, head to the Lakehouse where they offer New England favorites with a twist such as Lobster Corn Chowder. If you are looking for a party, Town Docks is the place to be. This outdoor Tiki Bar offers specialty cocktails and is only open during the summer months, but we promise this is a stop you want to make. For a great, local theatre company, check out the Winnipesaukee Playhouse. The playhouse offers community and professionally based productions all year long. Current showings offer their holiday professional show, Snow White, and upcoming shows for the 2018 season include, The Jungle Book and Ghost: The Musical. This is your destination of choice for great live performances in the New Hampshire Lakes Region. The Playhouse also offers light snacks and refreshments during intermissions with both matinee and evening performances. For more information on upcoming shows check out their website here. If you haven’t had the chance to try out an Escape Room, you are in luck as one is located right in the heart of downtown Meredith. An escape room is a team building adventure game where players need to solve a series of puzzles, riddles, and clues to complete an objective and escape the room. Crack the Code is meant to last for 60 minutes and currently offers two rooms: Blackbeard’s Revenge and KGBe Careful. So, bring your friends and family along for an hour of fun and see if you can Crack the Code! For more information, check out their website here. If you’re looking for something to do outside that isn’t on the Lake. Check out the sculpture walk, an annual exhibit of sculptures that are placed all around downtown Meredith. Sculptors from all around the Northeast are juried each year to participate. The walk includes 33 sculptures placed around the gardens of Main Street. During the summer months, July through September, you can take a guided tour or simply use the map to guide your own tour any time of year! Check out the website here for more information and a self-guide tour map. Who doesn’t love a glass of wine? 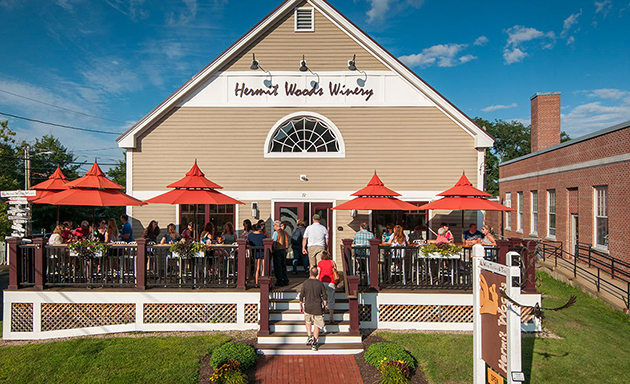 Head to Hermit Woods, a favorite local winery open year-round. Wine tastings are $8 per person and includes your choice of six selections, you also get to take home a souvenir tasting glass. If you want a little more education on the winery they offer full tours for $20 per person and it includes a 30-minute tour of the facilities along with a tasting. Hermit Woods has recently opened a deli adjacent to their tasting bar where you can order a glass of wine and select food items including charcuterie plates and panini’s. 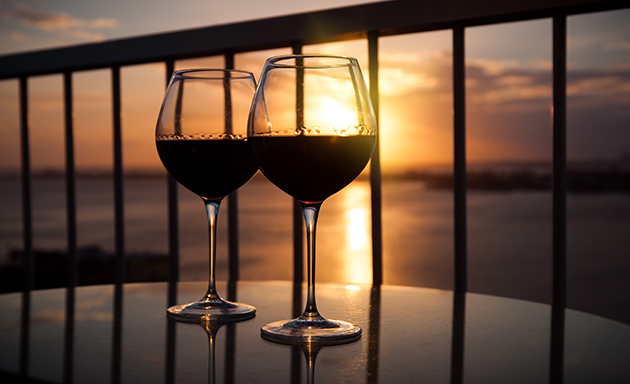 Grab a bottle to enjoy back on your balcony at the Inn while soaking in the beautiful views of Lake Winnipesaukee. Visit the Hermit Woods website for more information on their wines and tours here. On a rainy summer day or cold winter night, nothing beats a classic like going to the movies. BarnZ Cinema’s offers blockbuster hits all year-round. Evening tickets for adults are $9.00, children and seniors are $7.00 and they are running a bargain Wednesday special where all tickets are $7.00 per person. You can catch a matinee before 5pm for $7.00 per ticket. The Center Harbor Inn is currently running a special dinner and a movie package, if you are interested you can check it out here. For a great pizza joint, we highly recommend Giuseppe’s pizzeria located in the heart of the marketplace in Meredith. They specialize in gourmet pizza, salads, sandwiches, and amazing desserts. With two full bars and live music seven nights a week this popular spot is a favorite amongst tourists, so we definitely recommend making a reservation ahead of time to avoid long wait times. For a menu and list of live entertainment check out their website here. 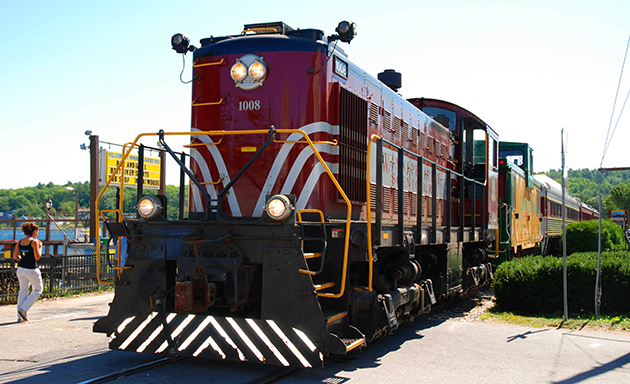 If being on the water isn’t your thing you can check out the Winnipesaukee Scenic Railroad. 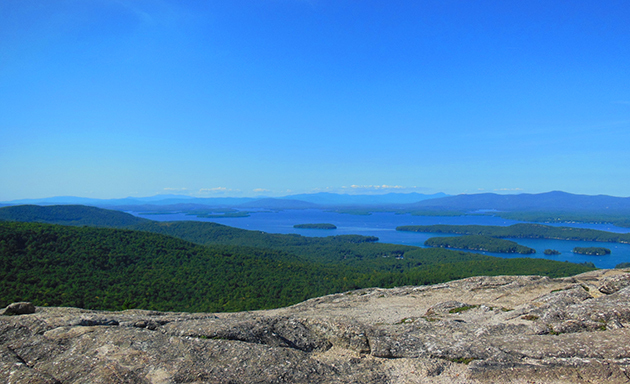 Enjoy a one or two-hour excursion along the shores of Lake Winnipesaukee with amazing views. 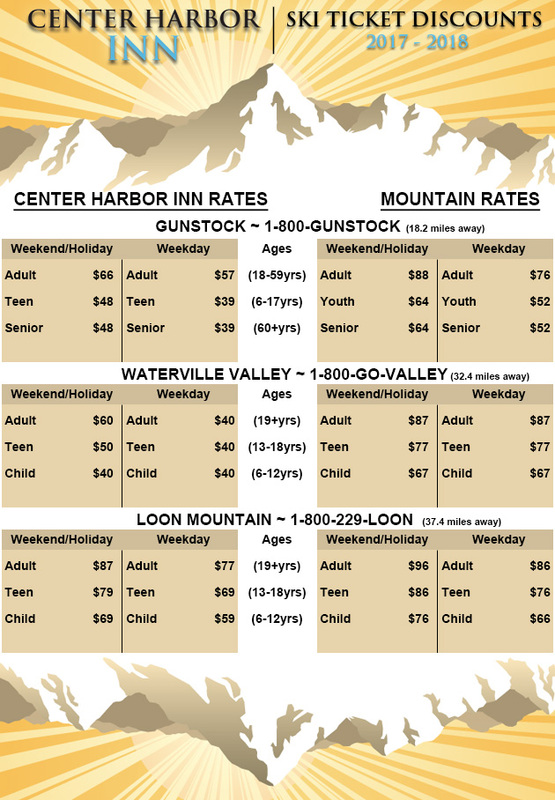 Open during the months of May to October you can select an experience catered to your interests, whether you want to catch the Fall Foliage or take a caboose ride, this is a great way to soak in all the sights of the New Hampshire Lakes Region by train. Check out the website here for more information and tickets. This small and inviting book store located in the marketplace of downtown Meredith, carries a great selection of books, games, and gifts for all ages. Aside from their product selection they also offer educational events throughout the year. Whether it’s meeting an author, an art project, or meeting Santa at the holidays, the Innisfree Bookshop brings a lot of fun to the area. We are proud to support small businesses and hope you make this a regular stop on your visit to Meredith, NH! Support local artists by taking a trip to the League of NH Craftsman Art Gallery in Meredith, NH. The gallery offers traditional and contemporary art pieces designed by juried members from the area. Visitors can find a variety of gift items from jewelry and pottery to glass and metal work. They also offer classes, demonstrations, and events throughout the year. Be sure to check out their website here for more information. Published on October 27, 2017 in Lake Winnipesaukee Hotel. Closed Tags: beer tasting, breweries, craft beer, Lake Winnipesaukee Hotel. 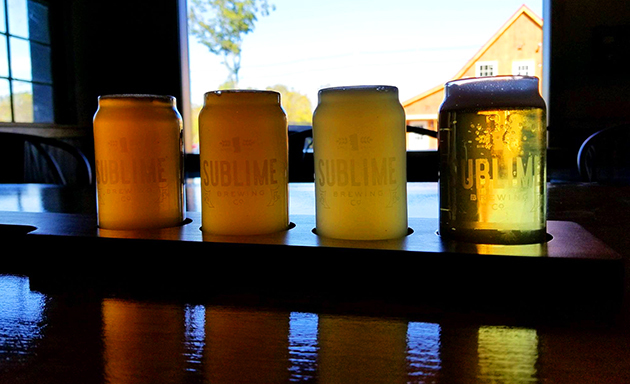 New Hampshire may be a small state, but the craft beer scene is alive and well. Beer enthusiasts from all over are flocking to the state to get a taste of the local microbreweries that have been booming over the last few years. So, come join us at the Center Harbor Inn where you can be in close proximity to tour some of the best breweries in New Hampshire’s Lakes Region. Located in Ashland, NH this brewery is small but packs a big punch. As you drive up you may be confused by the attached garage, but once inside you will see the charm of the rustic style bar. They brew their beer in 1.5-barrel batches and currently offer five different ales including a Pale Ale, Porter, English Brown Ale, IPA, Irish Stout, and also a German Lager. White Mountain Brewing Company is open four days a week, Wednesday through Friday 4:30pm-7:00pm and Saturdays 12pm-4pm. For more information check out their Facebook page here. Hobbs Tavern and Brewing Company located in West Ossipee, NH offers a countryside tavern and brewhouse at the foot of New Hampshire’s White Mountains. They are open daily starting at 11:30am and offer breakfast on Sundays starting at 8am. Their beers on tap are constantly changing which sets this place apart from others as every time you go in you can try something new. While you can enjoy a cold beer by the glass, they now also offer canned six-packs and half-gallon growlers to go. Aside from crafting their own beer, they have a full breakfast, lunch, and dinner menu, and they constantly have events going on from paint night and trivia to a murder mystery dinner. Make sure to check out their website here for more information. 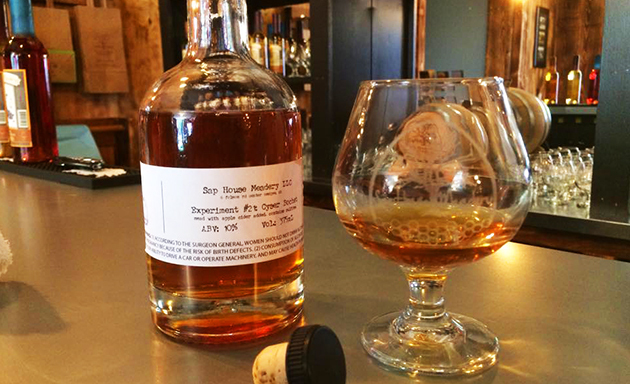 1766 brewing is handcrafted and brewed in Plymouth, NH. It started off with two guys who wanted to create something bigger for themselves, their family, and the community. They specialize in small batch artisanal beer and draw inspiration for their flavors from both the West coast and East coast, offering a rotating selection of beer based on the season and whatever their current inspiration is. The brewery is in the process of creating a tasting room and roof top deck, but for now you can taste their beers on tap at The Last Chair, an awesome wood-fired pizza joint. Their hours are Monday-Thursday 4pm-9pm, Friday and Saturday 11:30am-9pm and Sunday 11:30am-8pm. For more information on the beers check out their website here, and for more information on the restaurant check out their info here. The Lone Wolf Brewing Company is one of Lake Winnipesaukee’s first craft breweries. Located on Mill Street just walking distance from downtown Wolfeboro they offer a 100-seat beer hall with 10 rotating draft beer lines. Having started out as a small nano brewery relying on a one-barrel system, Lone Wolfe has worked their way up to a 15-barrel system offering a wide selection of beers. 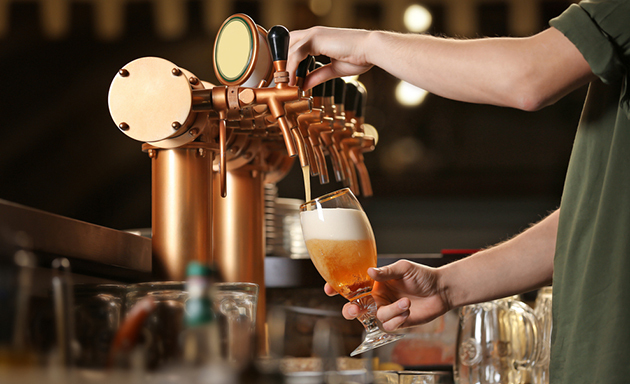 Enjoy a sampling of craft beers with easy access to the all of the shops and restaurants in the quaint lake town of Wolfeboro. Check out their website here for more information. Burnt Timber Tavern is located in Wolfeboro, NH and offers delicious eats and draft brews created on site. They are open for dinner on Thursdays and Fridays from 4pm-10pm and Saturdays they offer lunch and dinner from 12pm -10pm. The food menu is simple but filling, offering pub bites and various sandwiches and salads. 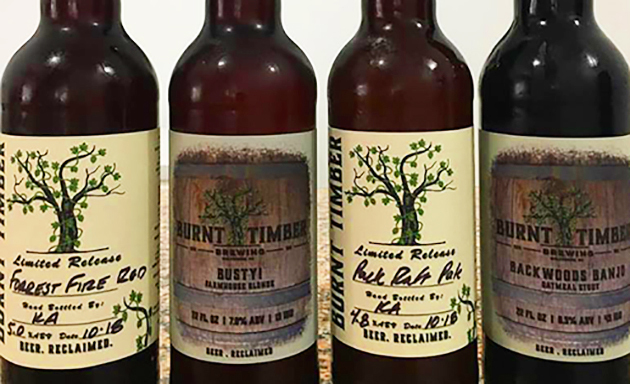 With roots as a small farm based brewery, Burnt Timber specializes in high quality, small batch brews. They offer a variety of their beers on draft and rotate the selection depending on the time of the year. Check out their website here for more information. Published on August 25, 2017 in Lake Winnipesaukee Hotel. Closed Tags: lake towns in New Hampshire, Lake Winnipesaukee Hotel, Lake Winnipesaukee Towns, NH Lakes Region. The quaint town of Center Harbor sits between Meredith and Moultonborough on the northwest shores of the beautiful waters of Lake Winnipesaukee. Center Harbor is in close proximity to major tourist attractions such as Weirs Beach, Meredith Center, the White Mountains, Gunstock and more. Boasting easy access to many of the most popular destination in the Lakes Region, Center Harbor also offers a low key, more laid-back setting for those looking for a little more peace and relaxation. The small town provides easy walking access to a variety of wonderful dining options, galleries, and shops and retains much of its original ambience dating back to the golden days of tourism on the big lake. Key area attractions include the home port of the M/S Mount Washington, the Canoe Restaurant, Lavinia’s Relaxed Dining, Lemon Grass Restaurant and Yikes Gallery. The bustling town of Meredith, NH is located on the north side of Lake Winnipesaukee just minutes from the Center Harbor Inn. With an abundance of tax free boutique shopping options, Meredith is one of the most popular spots on Lake Winnipesaukee. Although the town is always busy with its great mix of tourist attractions and restaurants including Guiseppe’s Pizzeria located in the original mill building, Meredith manages to keep its small-town charm. The town offers a variety of dining spots with lakeside views, whether you want to have a casual drink by the lake or a romantic dinner for two you can find it in Meredith. 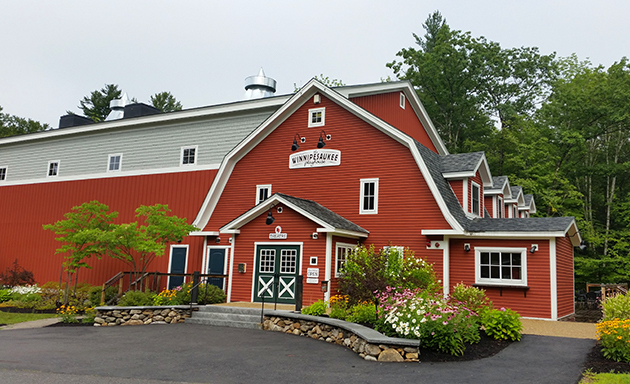 If you’re looking for some great local entertainment the Winnipesaukee Playhouse and Interlakes Summer Theatre put on shows all summer long. The town is also home to Hermit Woods Winery, they offer tastings on the weekends so make sure to check them out for a taste of local NH wine. Laconia is situated between Lake Winnipesaukee and Lake Winnisquam, and includes the village of the Weirs. The town offers a public beach as well as a pier that boasts a lively atmosphere all day and night. Weir’s Beach is currently undergoing a major revitalization project of the pier and you can find more information about that on on our sister resort’s website here. 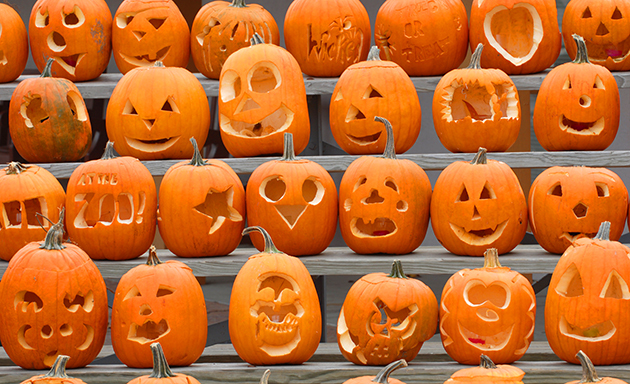 The town is also home to Motorcycle Week in the early summer, and the NH Pumpkin Festival in October. Check out the blog post on our sister resort’s website, a Guide to Weirs beach, for more information. 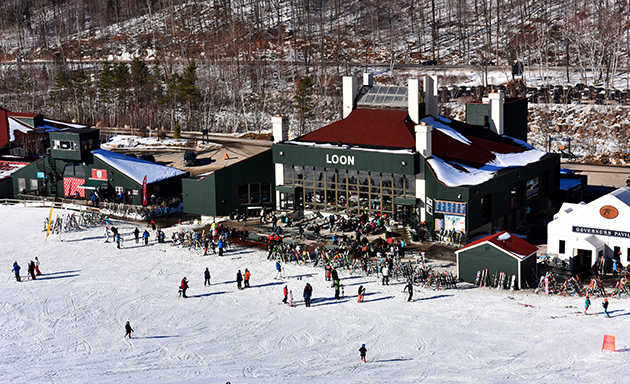 Other key attractions in and around Laconia include Funspot Arcade and the main embarkation for the M/S Mount Washington Cruise on Lake Winnipesaukee. The town of Alton, located on the southeastern end of Lake Winnipesaukee, is home to the village of Alton Bay. This town is a popular destination for hikers as it is home to Mt. Major, which offers some of the most beautiful views overlooking Winnipesaukee. 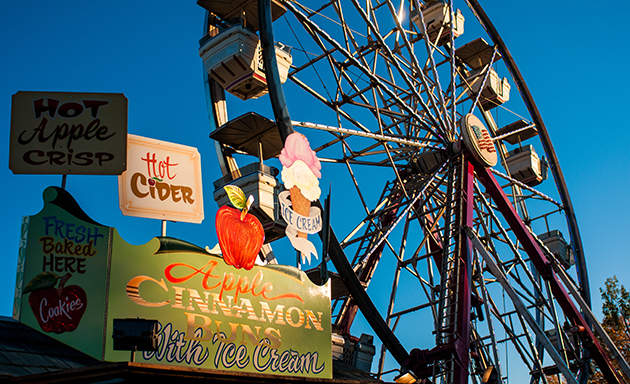 With food options including fried clams at Pop’s Clam Shell, lakeside dining at Shibley’s at the Pier and variety of ice cream stands, Alton presents a 1950’s vibe that allows you to relax and slow down life a bit as you watch the boats cruising in and out of the bay. The town of Wolfeboro sits on the eastern shores of Lake Winnipesaukee at the head of Wolfeboro bay. 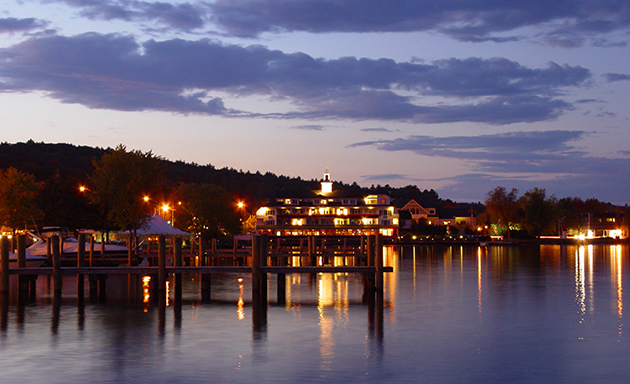 Wolfeboro which is commonly referred to as “The Oldest Resort in America” offers a picturesque New England lake town. 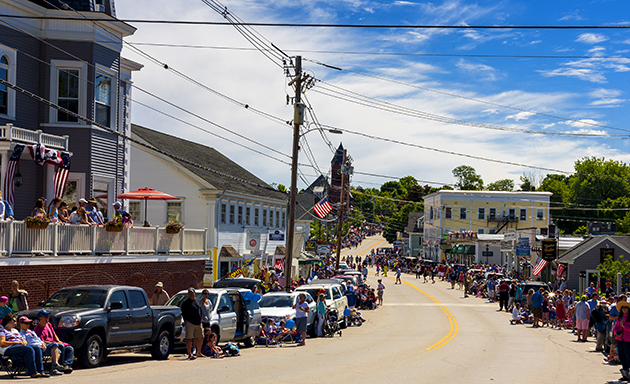 During the summer months, the town is bustling with concerts, theater, and craft fairs. Water enthusiasts and shoppers alike flock to this town where they can enjoy locally owned shops and boutiques, fishing opportunities and more. A tempting array of restaurants line the backstreets of town as well as the harbor itself which provide beautiful sunset views along Winnipesaukee. Key attractions include Garwoods Restaurant and Pub, the Downtown Grille Café, Nolan’s Brick Oven Bistro and Seven Suns Coffee and Tea Shop. For those looking for specialty treats try out the new Lone Wolfe Brewery location or hit up Bailey’s Bubble for some delicious ice cream. Published on August 4, 2017 in Lake Winnipesaukee Hotel. Closed Tags: Lake Winnipesaukee Hotel, lakefront, nh hotel. 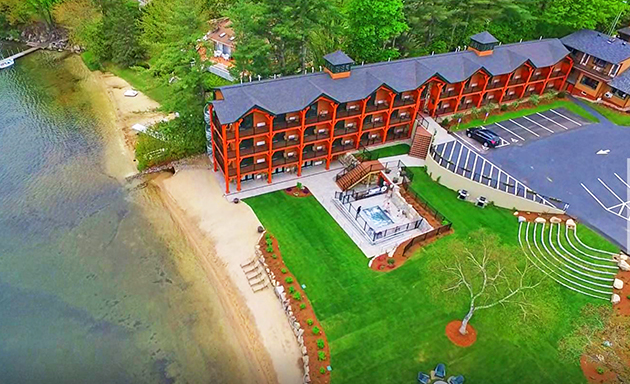 Overlooking the pristine waters of Lake Winnipesaukee, the lakefront at the Center Harbor Inn was made possible by vendors such as Stephens Landscaping who helped us bring our vision to reality. Upon your first arrival to the Inn you may be able to see the water from the parking lot, but it isn’t until you step to the top of the grand lawn steps that the beautiful transition from the hotel parking lot to the unique oasis of lakefront luxury becomes apparent. The steps open up in descending arch patterns to the lower lawn and offer a peaceful vantage point to watch activity on the hotel beach. We’ve even seen a guest or two read a book while looking down on the lake from here. As you descend the steps while gazing out onto the lake, the luscious manicured green lawn offers a soft contrast to the blue waters, metal railings, and wooden structure of the Inn. To your right you’ll notice the two weber grilling stations with bluestone pads that allow you to grill delicious burgers and still take in views of boat traffic and swimmers out on the water. Just down the slope towards the beach a beautiful, four-season hot tub awaits. Set in front of a beautiful stone retaining wall crafted by Miracle Farms and surrounded by hand-laid, heated pavers, the hot tub has been positioned at a grade to offer a breathtaking view over the lawn and beach toward the harbor. Enjoy basking in the warm water and watching guests glide across the bay in kayaks during the Summer or take in the scene of the local ice fisherman searching for the next big catch in the winter months. 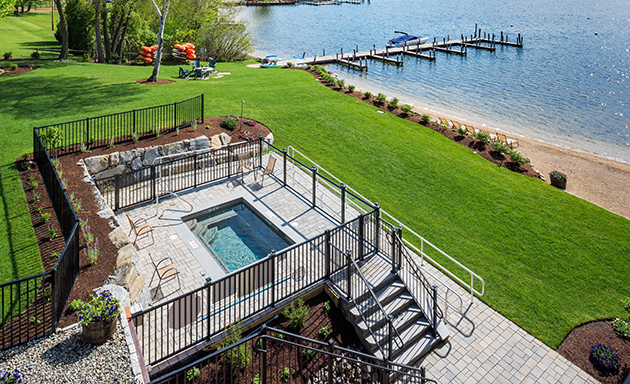 The fence surrounding the hot tub includes a long plexiglass span toward the beach side for year-round, unimpeded views of Lake Winnipesaukee. If you look left the fire pit was strategically placed far enough away from the hot tub and farther down towards the docks so you could get a clear view of the bay including the other side of the hotel. Sit by the fire at night surrounded by friends and family and watch as the stars come out over the lake. The oversized, Adirondack chairs by the fire also offer a great spot to unwind during your New Hampshire getaway. 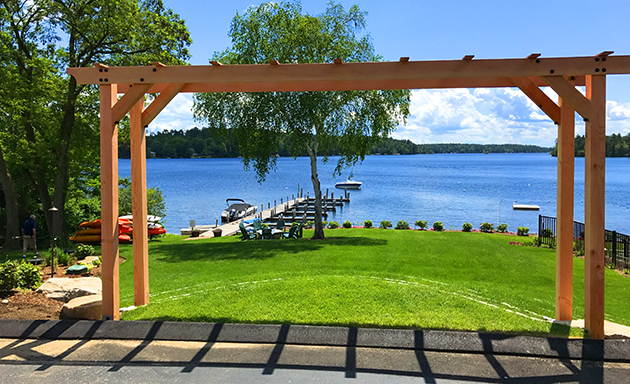 We took a natural lakefront that was already one of the ideal spots on Winnipesaukee and transformed it into a true oasis of unparalleled lakeside beauty. With a natural sandy beach, the team wanted to accentuate the existing strengths and add design elements to bring together a truly ideal Winnipesaukee experience. Throughout the lakefront, flowers and plants enhance the area with a romantic feel. We picked a variety of short plants so not to block the view from anywhere you are. One big white birch tree was left as we felt it helped to romanticize our vision. If you continue down the hill onto the nearly 200 feet of sandy beach, a rock wall separates you sitting on the beach in one of our new beach loungers from the rest of the lawn enabling you to fully soak in the beautiful lake views. We added a top coating of several inches of fresh sand during the construction process to improve what was already one of the best locations on the lake. Enjoy an afternoon of watching the boats come in and out of the hotel docks and moorings from the comfort of your chair. The Inn also offers an array of water craft rentals, so grab a kayak and head out on the water or simply take a dip in our swim area and head out to the raft. The Center Harbor Inn lakefront offers something for everyone, whether you want to be right on the water, sit under a tree and enjoy a book, hop in the hot tub for a late-night soak, or sit around a fire with family and friends; take your vacation to the next level with the lakefront oasis at the Center Harbor Inn. Published on July 26, 2017 in Lake Winnipesaukee Hotel. Closed Tags: lake life, Lake Winnipesaukee Hotel, nh hotel. If you’re a boater, you know boating isn’t just a hobby, it’s a lifestyle. At the Center Harbor Inn, we want you to bring your boat with you and explore all that Lake Winnipesaukee has to offer. With 16 Dock Slips, 8 Moorings, and easy access trailer parking you can be sure to enjoy a hassle-free vacation. If you are new to the area and aren’t sure what to do or where to go by boat we have a great day planned out for you. As we all know life at the lake is more fun when you are out on the water exploring. Wake up early and visit the continental breakfast to grab some locally sourced bagels and fresh coffee to go. 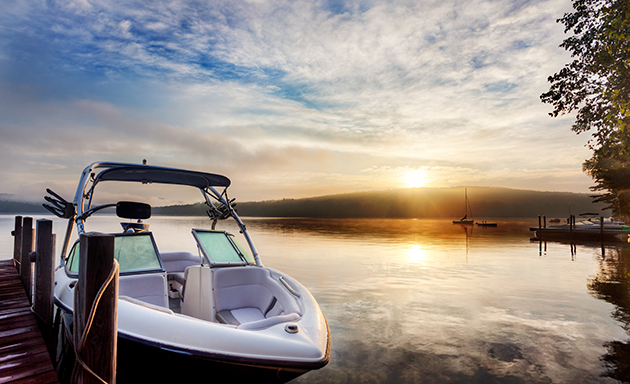 Head out at first light to take advantage of the quiet harbor with an early morning ski or wake board ride. These early hours offer the perfect mix of calm, chop-free waters and amazing lighting to enjoy the natural beauty as the sun comes up over the bay. Stretch your legs from the active morning adventures and head across the street to the EM Heath Supermarket for your standard boating fare; load up a cooler with cold beer, white wine, cheese and crackers, and a few waters. 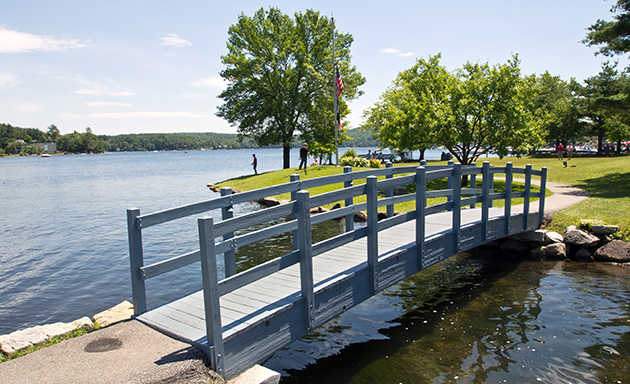 Get back on your boat and head across the lake to the quaint town of Wolfeboro. This route will take you along the length of the big lake and offer a life changing perspective on why Winnipesaukee is truly a natural gem of New England. When you arrive at Wolfeboro Harbor, grab a spot at the town docks. Enjoy sitting on the lakeside deck and patio at Garwood’s for an early lunch and sample some delicious oysters while watching the boat traffic taxi in and out of the docks. Head back to the Inn and dock your boat so you can freshen up, shower, and get ready for dinner. Take a short walk into town to enjoy a meal at either Canoe or Lavinia’s. Lavinia’s offers fresh fare made by local ingredients and puts a new twist on traditional New England comfort foods. At Canoe enjoy sitting back with a glass of wine in their rustic style restaurant with the most beautiful views of the Lake. Don’t forget to save room for dessert, stop by Dewey’s Ice Cream Parlor. They serve up some awesome homemade ice cream. If you can, try out their specialty homemade soda’s because Coke will never taste the same again. Then, get back on your boat for a sunset cruise to tour the beautiful lake homes along the shores of Center Harbor Bay and out towards Long Island as the sun settles into the nearby mountains. Once the sun goes down, head back to the Inn to relax and enjoy the outdoor fire pit. Gather round with other guests at the Inn and share your favorite spots from the day. Head in to sleep, wakeup, and repeat. That is the lake life after all.